CLOSET | ORGANIZING & STYLING 101 | — Minne Pristine & Co. This month, I had the pleasure of partnering up with Katie from Adorned Homes and Bridget from Covered Uptown to work on a Seasonal Closet Collab! We brought our forces together to share how to organize and style for the Fall season. Follow along from some tips and tricks! * Pristine Closet Tip: Use matching hangers throughout the space for a seamless look. The next step was organizing the jackets and bottoms by color - Color coding is a great way to keep your closet looking beautiful, as well as time saver for getting ready! I organized the shoes/sweaters/accessories section by shelves. Shoes were organized by color and rotated front/back to give a better visual, as well as allowing more shelf space to fit additional shoes. I used the middle shelf for the remaining shoes and balanced the pair with hats on each side. The top 2 shelves were used to store large sweaters. I choose to use the File Fold instead of hanging, because larger sweaters can often take up a lot of space when hung and the hangers can potentially cause wrinkling in the shoulder area. This is also a seasonal item, so folding makes it easier to change out when Spring comes along! * Pristine Tip for Organizing Accessories: Create a hook system in your closet space. This will help keep your accessories accessible and leave more room on your closet shelves for shoes or larger clothing pieces. I used the pull out hook in this shelf section to display a favorite handbag! Another important step in editing and organizing a seasonal wardrobe is trying your clothing pieces on before putting them back into your closet space. This will eliminate pieces that may be worn out/outdated, leaving more room for your everyday wear and adding in new items. As we talked about before, the benefit of having organized closets when selling your home is so important! If a buyer opens the closet and stuff falls out all over the floor it immediately gives a poor impression! 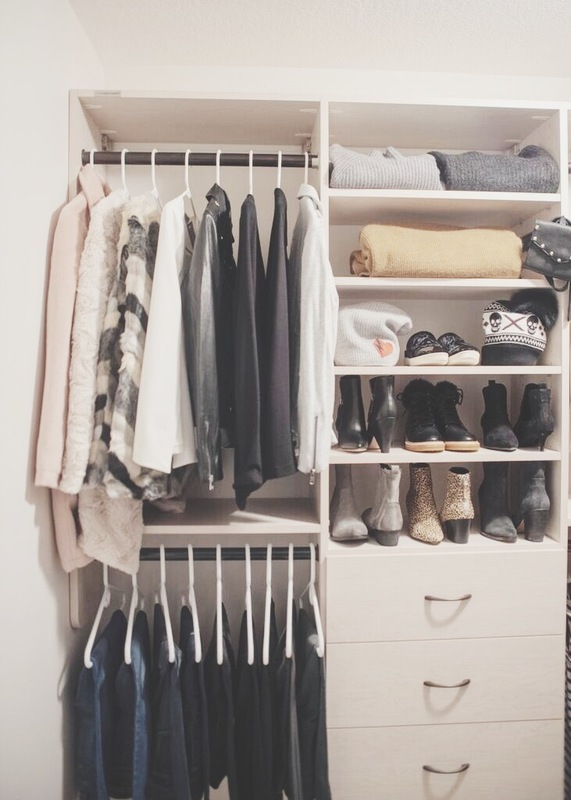 It can be hard to keep all of your clothes in the closet while selling your home and still keeping it organized, especially with changing seasons! This time around, we swapped out a section of the closet for Fall clothes from Covered Uptown. The clothing that you don’t need can be stored during the sale process making the closet clean for prospective buyers and easier for you to get ready in the morning! Store away anything extra that makes the closet feel cluttered or too full! Selling or not, these tips are great for living a more organized life. Having less pieces to choose from and more quality pieces can make a world of difference! A huge thank you to Covered Uptown for joining us for our day of fall clothes and organization! I think I need that skull beanie! As a stylist I am always keeping a client’s closet in mind when pulling looks for them or when they’re in shopping for new pieces! Having a well organized closet season by season is so important for daily dressing but also for shopping! When you style your closet each season, you are able to see the voids that need to be filled and are also able to find replacements that need to be made. When you bring out your fall clothes you may notice that your favorite black booties are salt stained or that your go to layering tees are looking a little scraggly. Donate and refresh! At Covered, all of our resident stylists are there to help you fill your voids, refresh your favorites, or just find the perfect something new. All clothing and accessories featured in this post are courtesy of Covered Uptown.